Each frame is .1 seconds apart. Aaron Peirsol's new world record set in this event was 1:54.66. This view is from the swimmer's right side. The subsequent analysis for this section of the Swimming Science Journal is a companion to this one and looks at the swimmer from his left side. Frame #1: The right leg kicks to counterbalance the left arm's vertical movement component as it begins to exit by executing an up and inward sweep. The depth of the kick allows some propulsion to be generated. The leg position should be compared to what might be possible in crawl stroke to see that the actions are dissimilar. In crawl, if the leg were in this position the foot and lower leg would be out of the water. The right arm enters behind the right shoulder on the back of the hand. If the arm had entered behind the head, a common fault with many backstroke swimmers, valuable time would have been lost repositioning the arm and hand to where they could start being effective. The swimmer's streamline is very impressive. Frame #2: The right leg kick involves raising the knee by flexing at the hip. This positions the lower leg such that it can kick backward as well as upward. Once again, comparing this position to what would happen if it were attempted in crawl stroke, the dropped knee would increase frontal resistance making this kick inappropriate for that stroke. The hand has rotated just past vertical while the arm is still hyperextended. The left arm continues its inward and upward sweep. Frame #3: The right leg kick is completed as the left arm exits the water. The right hand has adjusted its rotation and flexed at the wrist to establish a direct backward orientation. The left leg has dropped ready to kick to counterbalance forces created by the right arm propulsive actions. Frame #4: The right arm presses backward, begins to flex at the elbow, and adducts at the shoulder. The left leg kick stops the arm's lateral and vertical forces from rolling the body and shoulder to the left. Excellent streamline is maintained. The shoulders and hips have rotated approximately 45° to better position the propulsive surfaces of the right arm. Frame #5: The size of the drag pocket (turbulent water) on the back of the pulling right arm shows how effective and powerful is this swimmer's pull. Although obscured in this frame, the whole arm contributes to propulsion as vigorous adduction of the upper arm powers the action. There is considerable flexion at the elbow, presumably at least 90°. The lower arm and hand are positioned at 90° to horizontal to maximize horizontal propulsion. Frame #6: The drag pocket can be seen to extend from the swimmer's fingers to the right arm pit, demonstrating the total arm surface being used to generate drag forces of considerable magnitude. The left leg kick is completed and the right leg prepares to kick. Frame #8: The left arm has entered. The right arm pushes completely back and downward. Propulsive power is still generated in this action as can be seen from the considerable drag pocket coming off the hand and lower arm. As with the counterbalancing action of the right leg in the Frames #1 through #3, the same role is filled here by the left leg (it counterbalances the right arm's up and inward sweep). Frame #9: The left hand has rotated, and both the wrist and elbow begin to flex as propulsion occurs due to adduction at the shoulder. The left leg kicks. Frame #10: The amount of bend at the elbow in the propelling left arm is obscured because of the angle of viewing this action. [That is why the next analysis shows the arm in more detail when it is viewed from the left side.] The right arm has exited. The right leg has just started to kick (there is turbulence following its movement). This kick counterbalances both the left arm's propulsive forces and the forces created by the recovering right arm. Frame #11: The left arm pushes directly backward. Full-arm turbulence is observable in this frame. The right arm is at a vertical position in the recovery. The right leg begins to kick as the left leg finishes its kick. Frame #12: The upper left arm is in an early stage of abduction. Frame #13: Left arm abduction is completed and the lower arm begins to extend at the elbow. Frame #14: The left arm has extended back and downward and is preparing to sweep up and inward. The movement is continuous across the transition with no sudden direction changes or halting of the movement. Frame #15: The position in Frame #1 is duplicated and a new stroke cycle begins. Aaron Peirsol employs an effective direct propulsive action. There is no "S-shaped" pull that exaggerates vertical components in the arms' movement patterns. Any vertical movement components that occur are necessary to maintain effective direct propulsion. 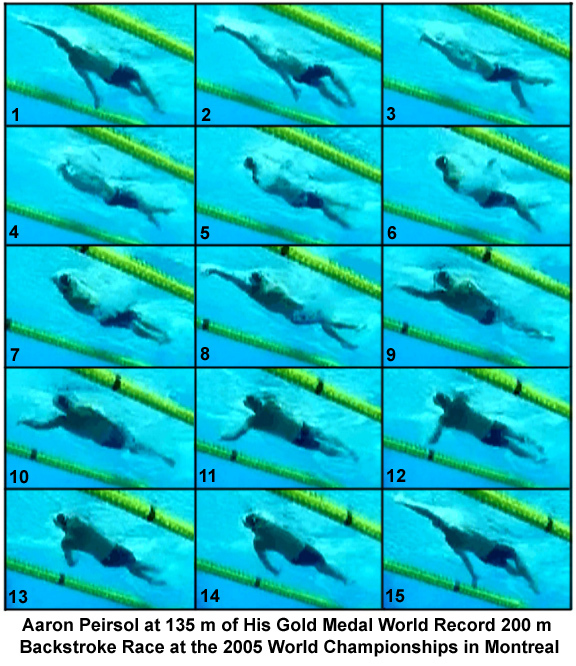 The full stroke cycle takes 1.3 seconds and in that time, the swimmer executes six full kicks.